The Letter From New Orleans — “pointless, sporadic, and free”— began as a bunch of emails to interested parties, from New Orleans. 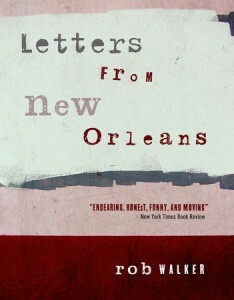 The book Letters From New Orleans, includes all the Letters, as well as additional material. Subjects covered in Letters From New Orleans include: Celebratory gunfire, rich people, religion, the riddle of race relations in our time, robots, fine dining, drunkenness, urban decay, debutantes, the nature of identity, Gennifer Flowers, the song “St. James Infirmary,” and mortality. All author proceeds from Letters from New Orleans will go to relief organizations such as the Red Cross and others working with victims of Hurricane Katrina, until their situation gets significantly better, or, I suppose, mine gets significantly worse. Update: For the last few years, and into the future, author proceeds (admittedly, modest at this point) now go the Neighborhood Story Project, an excellent New Orleans enterprise you should support. To listen to a podcast (mostly) about the book from the Philadelphia Daily News’s PhillyFeed, click here. To read an interview about the book from Jessica Lee Jernigan’s blog, click here. In “Letters from New Orleans,” Walker contemplates, almost wistfully, various notions of denial and self-invention and loss — those masks that symbolize the city aren’t lost on him. And his pointed, witty insights about the city won’t be lost on readers. This is not a travel book per se, but rather an outsider’s account of America’s strangest town. … This transplanted New Yorker (via Texas) gives familiar places a new twist, a fresh perspective … . The chapter on R&B singer Ernie K-Doe’s lounge is a masterful little piece of social observation …. . Seeing the city through Rob Walker’s eyes reveals a place at once familiar and yet different. Rob Walker has captured so much truth about New Orleans, and so beautifully … This book is casual on its surface but demonstrates a reporter’s eye for detail and background, weaving together interviews, observations and teasingly small bits of personal information. Walker’s first person vignettes are marvelously crafted and richly conceived. But its Walker’s humor that makes Letters From New Orleans truly unique. … We strongly recommend this enlightening, eccentric, and most importantly highly entertaining book. It has temporarily changed our opinion about memoirs. The quality that makes Walker’s “modest series of stories about a place that means a lot to [him]” rewarding reading is his immersion in the local. Neighborhood bars, regional history, hometown notables and a dash of mayoral politics reign in the recurring presence of New Orleans’ dominating event, Mardi Gras. Walker’s book, “not a memoir, a history, or an exposé,” won’t help a tourist get around in New Orleans, but it will help him or her see beyond the tour guide’s pointed finger. Wonderfully written, graceful and simple yet full of insight, presenting the city in a way that’s rich and textured. Walker’s musings reveal him to be an astute observer of human nature, urban renewal (or lack thereof), tradition, music, economics, frivolity, and other sociocultural phenomena. … Letters succeeds as a collage of eloquent impressions of New Orleans and reads like thoughtful dispatches from a learned friend. This book is far more than a poetic testament to a strange and wonderful town. It’s a story about a city boy who recognizes the need to slow down and observe carefully—a story of a couple who learns to let our word’s odd richness really sink in. I recommend it to anyone who feels life is going by too fast. Rob Walker’s meditation on a three-year sojourn in New Orleans is as wistful as absinthe, as funky as a muffuletta at a joint off Tchoupitoulas.